Larson Electronics, a leader in the industrial and commercial lighting industry, has announced the release of a new dual colored hazardous location LED warning light equipped with two 10 watt LED lamps and an audible explosion proof horn. This unit is NEMA 4X rated for hose down areas and carries UL 595 compliance for outside marine locations. The HAL-TL-2X10W-C-OXM-PA from Larson Electronics is a Class 1 Division 2 oxygen level warning light that is approved for use in hazardous environments where explosive and flammable gases, vapors, and dusts stand the potential to exist. This hazardous light is designed for use in industrial environments where oxygen levels are monitored within the atmosphere and have the potential to fall below the OSHA recommended oxygen concentration within the work environment. This signal light is equipped with two 10 watt LED lamps that produce a green and blue light output. Each lamp is equipped with a warning sign to indicate the status of oxygen levels within the environment. A green LED lamp illuminates the “OK” sign to indicate that the oxygen levels are satisfactory. 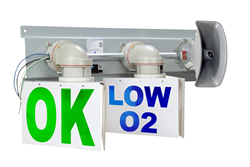 A blue LED lamp illuminates the “LOW O2” sign to indicate that oxygen levels have reached an unsatisfactory level. When the blue LED lamp turns on due to low oxygen levels, the warning horn will sound to alert people within the vicinity of the situation. The horn reaches a peak output of 110dBA which is powerful enough to be heard over industrial operations. This indicator light works in conjunction with existing oxygen level monitoring systems and is used to provide a visual indication of levels. These lights can be configured to operate on a steady burn, a strobe or a steady burn and strobe combination and each LED lamp offers an exceptional 1,050 lumen output. The LED lamps are housed within a waterproof, corrosion and chemical resistant body that is equipped with Pyrex globes and a polycarbonate globe guard. This unit is weatherproof, dust-proof, and marine rated for wet environments. Power for this unit is provided by a shared neutral and ground, with separate hot wires for each lamp. This warning light can be configured to work on 120 volts or 240 volts AC for use with standard line voltages or 12/24 volts DC for low voltage operation. Mounting is provided by a heavy gauge aluminum base with predrilled holes designed to be bolted to walls and flat surfaces for permanent and secure attachment. This hazardous area LED warning sign light is configured for green and blue output, offers exceptional lumen output, and a 50,000 hour life span.